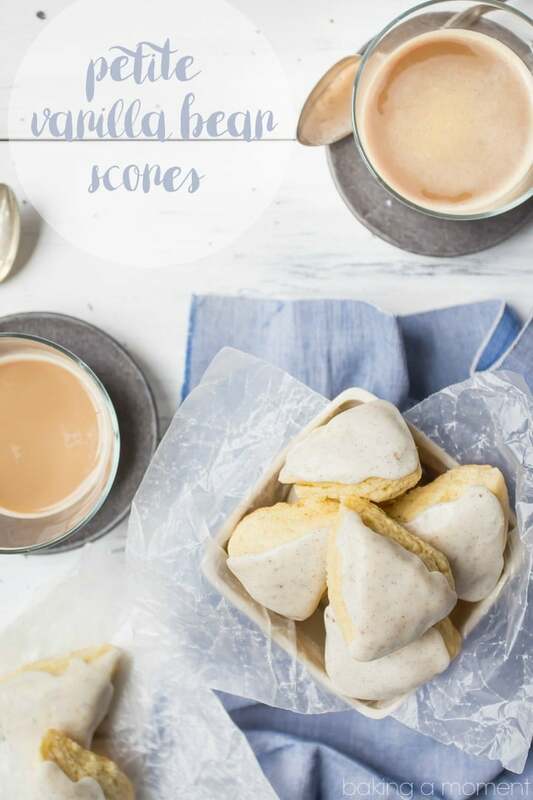 These petite vanilla bean scones are even better than the Starbucks original! So simple to make, and so good with your morning coffee! Welp, I finally got off the caramel and cheesecake train. I’m sure you’re disappointed, but I’m sorry, it’s just time. It was a good run but variety is the spice of life, after all. 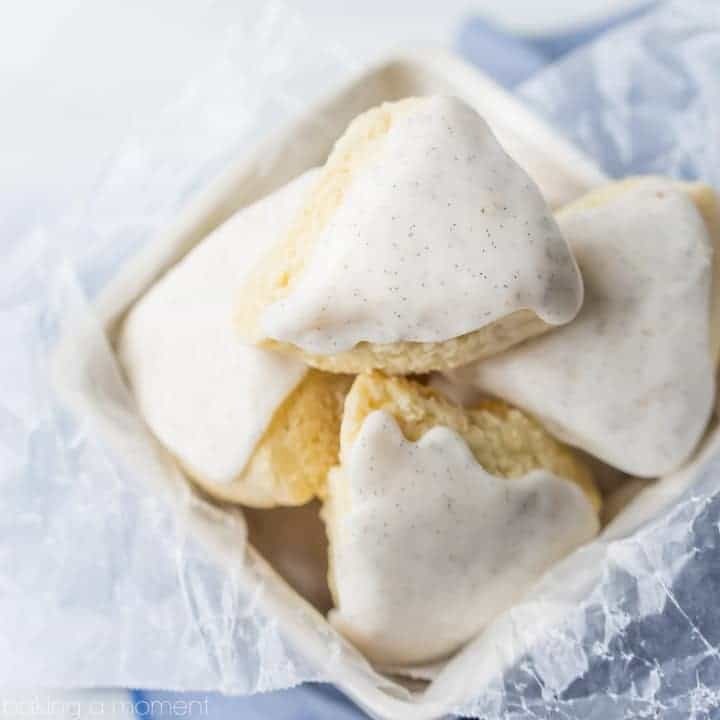 I know it’s going to be a hard thing to get over, so to make things a little easier, I made you some petite vanilla bean scones. Now, that’s not so bad after all, is it? 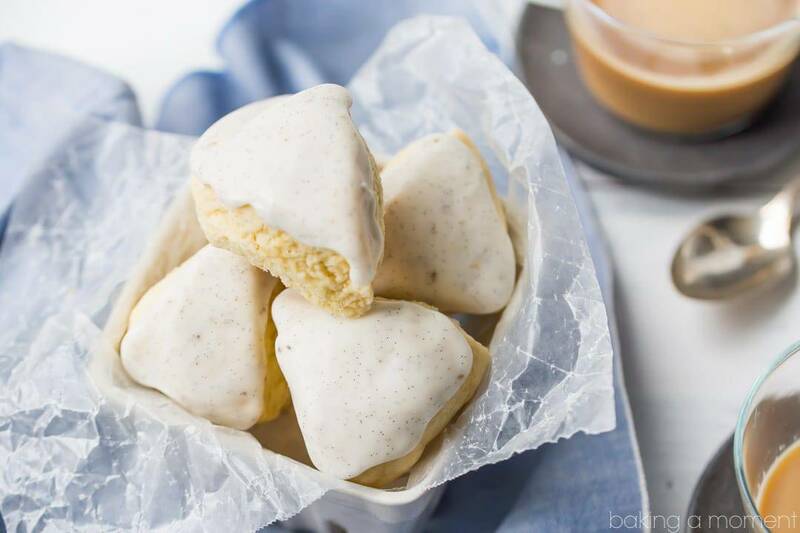 Petite vanilla bean scones! Cute little lumps of tender, buttery, pastry goodness, smothered in a sweet vanilla-bean flecked glaze. Just like the Starbucks kind! 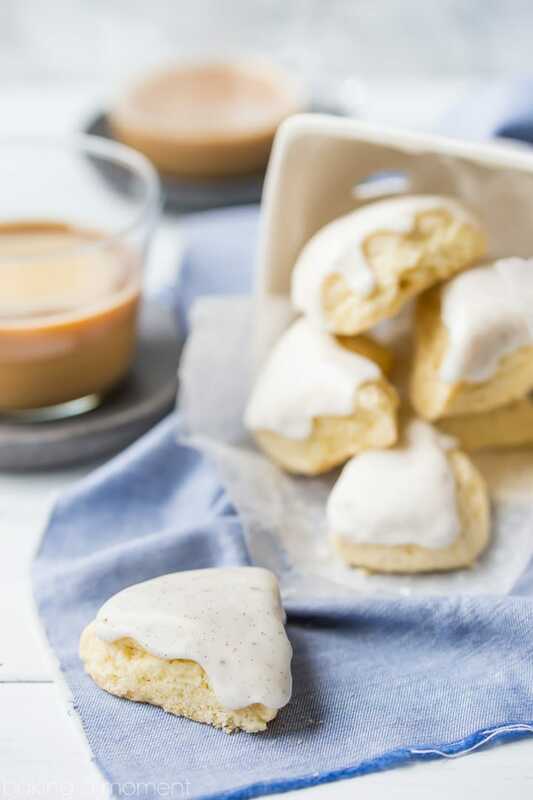 These are made with real ingredients, like fresh butter and cream. And that, in my opinion, makes all the difference in the world. Not to mention they’re fresh and warm from the oven, in just about 30 minutes flat. You just cannot beat a freshly baked scone for breakfast or brunch. Especially with a cup of something hot! So get out that food processor, and get ready for the most tender, fluffy, and vanilla-y scone you’ve ever sunk your teeth into! *Note: I HIGHLY recommend using real vanilla beans for this recipe. Their flavor and aroma is just so incredibly heady and sweet. I ordered a handful on Amazon and the quality was phenomenal (see link below recipe card). But in a pinch, vanilla bean paste would also work well. More great breakfast treats on my “Breakfast/Brunch Recipes” Pinterest board! Place the flour, sugar, baking powder, and salt in the bowl of a food processor, and whisk to combine. Pulse the food processor until the mixture resembles coarse meal. With the food processor running on low speed, stream in the cream and the vanilla extract. When the dough has gathered itself into a ball, turn off the food processor and divide the dough into three equal portions. Flatten each portion of dough into a disc shape, about 1 1/2-inches thick. Score each disc into 6 triangles with a knife, and pull the triangles slightly away from one another (allowing about 1/2-inch in between). Bake the scones for 16 to 20 minutes, until set in the centers and slightly golden on the bottoms. In a small bowl, stir the powdered sugar, vanilla bean seeds, and milk together until smooth. Spread a small amount of glaze on top of each scone. I’m just about to make this recipe. They looks amazing! Quick question. There’s no egg in this recipe? Just wanted to double check! Thanks. Yes that’s correct- no egg in this one! They come out spectacularly tender. Hope you enjoy! Just made these and they’re great! I no longer frequent Starbucks, but their petite vanilla bean scones were always my biggest vice. These taste just like them, but a fresh, homemade version free of additives and preservatives is infinitely better! Do the scones have to cool down before I add the glaze? No not at all- it’s totally fine to glaze them while they’re still warm! Hope you enjoy!